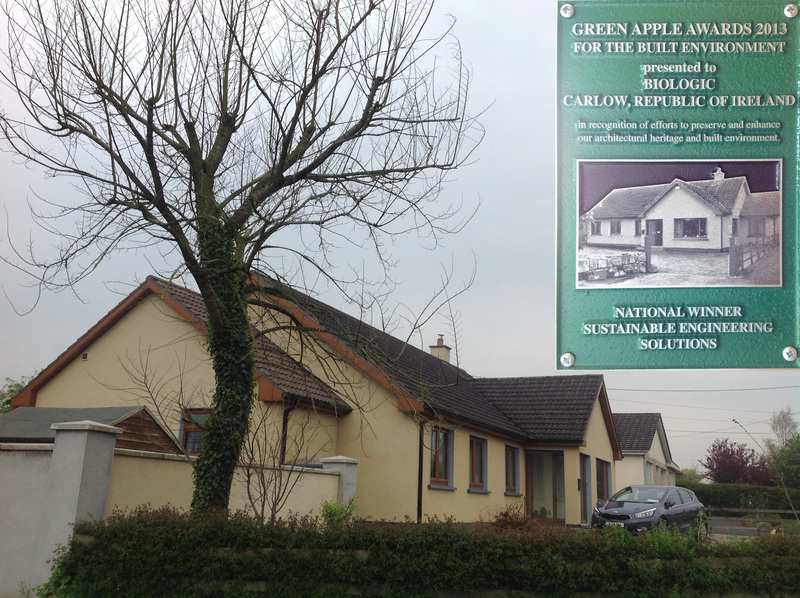 Carlow, a town situated about 80 kilometers from Dublin, is the site of the most energy-efficient 1970s bungalow in the country. Formerly, it was a typical energy-guzzling construction from the period with energy bills running to thousands of euro a year – today it consumes less energy yearly less than a passive house. Bills for all energy consumption including electrical appliances are in the region of several hundred euro only. This achievement was recognised when it received a Green Apple Award in 2013. A study carried out by Italian architect Giovanna Barbaro verified how the energy consumption and indoor comfort of the 130 square meter bungalow have been improved. Having been built decades before the entry into force of the national BER (Building Energy Rating) protocol, many of the bungalow’s rooms had problems with mould, high moisture levels, significant thermal bridges and levels of discomfort for the occupants. Two components of the original structure were retained, namely, the cavity wall envelope with a total thickness of 300 mm made ​​of two rows of prefabricated solid concrete blocks 100 mm wide, separated by an air chamber without thermal insulation, and the original roof. 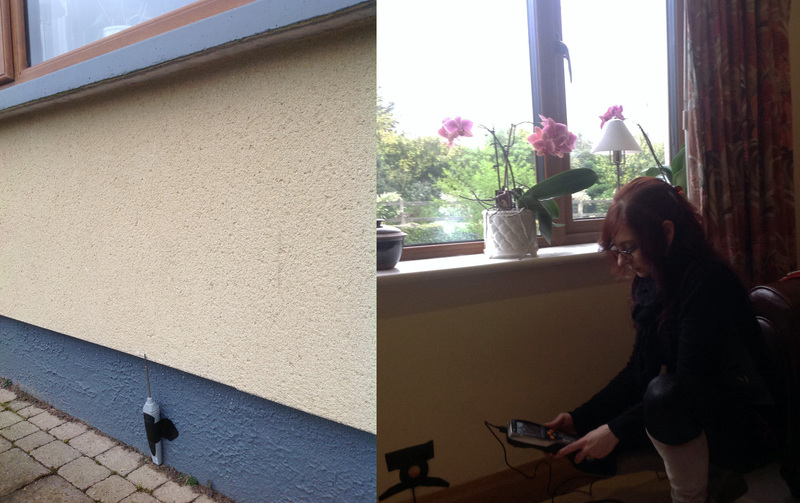 A pre-retrofit energy audit (with infra-red camera and blower door test) identified significant thermal bridges (with a ∆t up to 5°C). The thermal insulation of the wall envelope was improved internally (by filling the cavity wall with rock wool) and by applying insulation to the wall’s inner surface. Extra insulation was added to the roof at ceiling level and 25 cm of floor insulation was added to a previously un-insulated suspended wooden floor. This significantly improved the energy performance of the building reducing U values by up to 93% for the walls which now have a theoretical transmittance of: 0.12 W / mq.K, with U-values of 0.10 W / mq.K for the roof and 0.15W / mq.K for the floor. A U-value of 0.65 W / mq.K has been achieved for openings by using PVC doors and triple-glazed windows of 52mm thickness. Once the annual energy requirements (in steady state) had been determined by evaluation of the monitoring data (all data relating to energy generation and consumption is continuously monitored), the designers sized the renewable energy plant based on the actual consumption requirements of a four-person family. The original thermal plant (oil boiler) was replaced with a system powered by solar panels, both thermal and photovoltaic, for the production of thermal and electrical energy. In total, this occupies 32 square meters of the south-facing pitched roof. An underfloor heating system is powered by 20 m2 of solar collectors which operates effectively using much lower water temperatures of 20º to 25ºC as compared to traditional radiators which operate at 40ºC plus. An air-to-water heat pump (Coefficient of Performance (COP) of 316%) provides back up for the solar thermal system and only switches on when the fluid temperature inside the 100 litre capacity inertial combined accumulator (for both DHW and heating) is lower than the preset temperature required (typically 35°C). During the onsite assessment, at 8 pm at the beginning of the spring the thermometer indicated a temperature of 36.7°C derived from solar heating. The DHW plant also satisfies a rare environmental sustainability criterion as the water is provided by a rainwater collection tank (supplied by one side of the roof) which is filtered and sanitized for consumption by UV light before use. The solar panels are integrated into the roof which is set at a 37° angle which is coincidentally the optimum angle to take advantage of the solar radiation in winter for Carlow’s geographical latitude of 52 degrees. From May to October the bungalow does not require any heat pump input while in winter the solar radiation captured by the thermal collectors meets on average 40% of the bungalow’s thermal energy demand. If we consider that the solar radiation in Ireland is very low compared to the average in Italy, then the performance achieved is truly impressive, not to mention far-sighted (see the renewable energy targets for 2017 set by the European Directive 2010/31 / EC including existing buildings). The thermal solar panels installed have better performance than conventional collectors as they are a hybrid model, compared with the two most widely diffused technologies, employing inner tubes containing solar concentrators which are partially under vacuum. The photovoltaic plant occupies 12 m2 of the roof and has an annual average output of over 3 kW which has been dimensioned on the basis of an accurate analysis of the family’s needs. 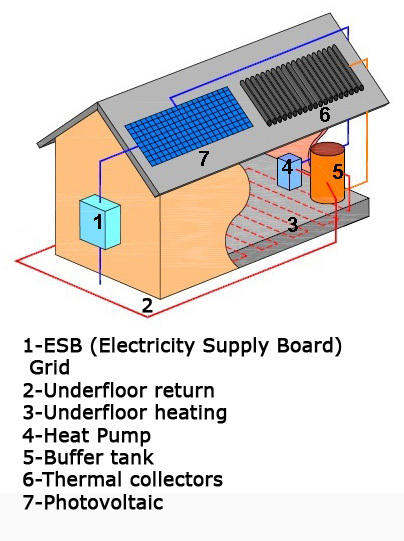 This is prioritized for use within the house with any excess energy produced being sold to the grid system. The excess ‘stored’ on the grid covers electricity costs associated with use of the heat pump in winter as well as a substantial proportion of the consumption of household electrical appliances. The panels are more productive in spring and autumn as in these periods up to 80% of the sun’s rays are oblique (meaning that the sun’s rays at midday are orthogonal to the collection surface). The dwelling has an A1 rating consuming a mere 5.45 kWh/m²/year or just a little more than a third of what a passive house of the same size would consume. In terms of environmental impact, this means that the annual emissions of greenhouse gases, corresponding to the said energy consumption, amounts to just 2.62 kg CO2/m²/year. The on-site indoor comfort was evaluated, first verifying the boundary conditions and especially the correspondence of the actual performance to those foreseen by the project for the north façade. 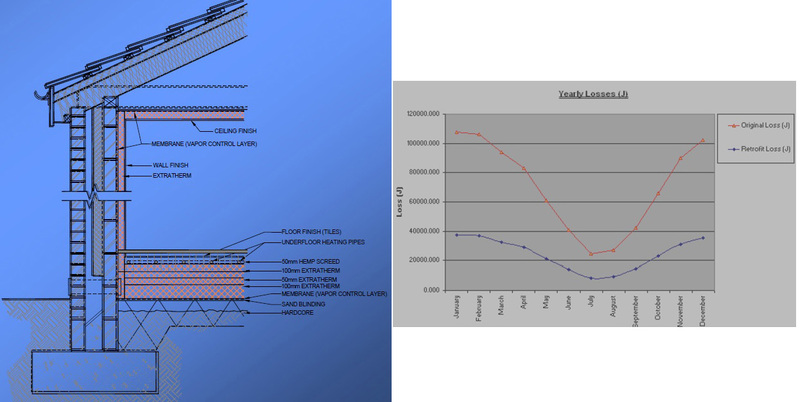 In general, when no technical documentation is available it is difficult even for an expert energy auditor to verify the building components’ performance, in particular those of the windows, without carrying out destructive tests. However, by checking the thicknesses of the slabs and the presence and correctness of the positioning of the low emissivity films it is possible thanks to the aid of a special tool (a laser glass measuring gauge) and a simple gas lighter. With regard to the assessment of air quality and discomfort factors the American ASHRAE 62: 2001 and the European UNI EN ISO 7730: 2006 were used as the reference standards. Using the gauge it was verified that the frame of the joiners is composed of three plates of 4 mm thick glass insulated with two air gaps of 20 mm thickness. A thermal flowmeter was used to check the transmittance value of the wall facing north in accordance with the ISO 9869: 1994 standard. The result came close to the theoretical values​​, only exceeding them by a few percentage points. This discrepancy is thought to be attributable to the presence of some moisture due to precipitation on the walls during the days prior to the test. Air currents in the prevailing living areas higher than 0.25 m/sec. Vertical air temperature difference (between the head and the ankles) exceeding 10°C. Horizontal air temperature difference (between left and right side of body) higher that 5°C. Abnormally low or high floor (temperature outside the range 19-26°C). Radiant asymmetry with a delta T higher than 3°C. None of these problems were found to be present. A key factor in the maintenance of indoor comfort is the presence of a mechanical ventilation system equipped with heat recovery working continuously to maintain an operating temperature in the range of 20° to 22°C in the cold season. Extractor vents exhaust the stale air from the sites of the greatest production of moisture (kitchen and bathrooms) while fresh air brought in from outside is pre-warmed and supplied to the other living spaces. This eliminates the need to open windows and the subsequent loss of heat from the house. A fast, and relatively cheap way to measure the quality of indoor air was obtained by measuring the concentration of carbon dioxide (CO2) as its content is directly proportional to the average metabolism of the occupants. With four occupants and at a temperature of 21°C and 55% relative humidity a CO2 level of 795.5 ppm was measured in the kitchen-dining room (which is well within the recommended limit of 1000 ppm). In conclusion, the audit proved that, even in a country with a predominantly cool and wet climate, it is possible to meet the ecological challenge of the new millennium: to significantly reduce the use of fossil fuels by means of renewable energy while simultaneously achieving excellent levels of thermal comfort, even when the interventions are carried on very poorly built existing buildings. Want to find out more? Just call us on 087 9678 372 or email info@biologiq.ie. ← What changes are expected from the revised ISO 14001?